Excellent ideas. I'm excited again about scrapbooking, especially in conjunction with my familly history. I just have to find some more hours in my day! Excellent I enjoyed their sweet easy way of talking and showing us the concepts of their Play to Create way of doing scrapbooking. I've been a scrapbooker for years and loved this presentation and YES, it does fit right in with genealogy. The special pages are the ones where spouse and kids help with journaling!!! If you could not make it to the live event or just want to watch it again, the 1 hour 39 minute recording of "Getting Started in Scrapbooking" PLUS the bonus after-webinar party is now available to view in our webinar library for free for a limited time. Or watch it at your convenience with an annual or monthly webinar membership. Use webinar coupon code - scrapbooking - for 10% off anything at www.FamilyTreeWebinars.com or www.LegacyFamilyTreeStore.com or www.Kiwilane.com, valid through Monday, February 2, 2015. Learn how to scrap your past and present quickly and easily. Scrapbooking is a wonderful way to preserve your heritage and those precious family memories, and in this Introduction to Scrapbooking webinar, we will show you how to use designer templates from Kiwi Lane Designs to create beautiful layouts that your whole family will love to look at! Join us for the live webinar Wednesday, January 28, 2015 at 2pm Eastern U.S. Register today to reserve your virtual seat. Registration is free but space is limited to the first 1,000 people to join that day. Before joining, please visit www.java.com to ensure you have the latest version of Java which our webinar software requires. When you join, if you receive a message that the webinar is full, you know we've reached the 1,000 limit, so we invite you to view the recording which should be published to the webinar archives within an hour or two of the event's conclusion. Susan Budge is a wife and a mother of five children — four girls and one boy. She is passionate about family, photos and creativity, all of which come together in her love of scrapbooking. She is currently the CEO of Kiwi Lane Designs, a scrapbooking and card-making company. Debbie Budge is a recent widow and the mother of 8 children. She has had a burning interest in researching her family history since the age of 17 and has been able to trace some of her family lines back to the early years of our country and across the sea to Germany and England. She currently is a co-owner of Kiwi Lane Designs, along with Susan Budge and her daughter, Shiloh Jorgensen. Debbie believes scrapbooking is a natural extension of family history as it both documents the lives of family members, both past and present, and brings their stories to life. These tips were presented live during the recent after-webinar party of Thomas MacEntee's recent webinar, My Genealogy DO-Over: a Year of Learning from Research Mistakes and compliment/reinforce what he taught. Got Nebraska Ancestors? There's a new webinar (and book) for that! 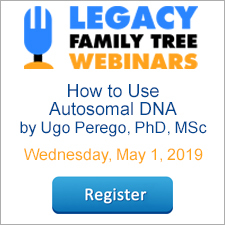 Legacy Family Tree Webinar Subscribers - check out our very first recorded addition to the webinar library. This was not a live broadcast but content specifically recorded to help you with your research. If you have Nebraska ancestors, presenter Ruby Coleman, President of the Nebraska State Genealogical Society, will set you on the right track to finding them. Be sure to download her accompanying syllabus as well. The time periods and types of records available in the state. Click here to watch the 41 minute recording of "Nebraska, A Genealogy Journey" and download/print the 4 pages of supplemental syllabus materials or click here to subscribe. Ruby's new book - all 536 pages - is the perfect companion to her webinar recording. It contains historical and geographical information, plus information for each county in the state. There are hundreds of URLs that will link to web pages that are a must when doing genealogical research. Some of the topics ... Trails, Road and Forts; Ethnic Groups; Land Laws and Records; Institutional Records in Nebraska and Farming and Ranching Records. Wonderful! I really enjoy hearing Thomas speak. I'm so glad he admits his past bad habits. I think pretty much every genealogist started out doing things wrong. And now he's leading us to do it right. Thomas laid out a clear roadmap for how to do a reset and restart your genealogy to exploit everything you've learned about capturing accurate information and citing sources -- "if only I knew then what I know now." In addition to the roadmap, he has so many useful tools, including his facebook group specifically for a do-over. Even if you don't want to do a complete reset, there are so many ideas and tools in this webinar, you will find something that will recharge your research. Legacy gives the BEST webinars ever. And today's was one of the best of the best. If you could not make it to the live event or just want to watch it again, the 1 hour 44 minute recording of "Expanding Your Research from a Single Fact" is now available to view in our webinar library for free for a limited time. Or watch it at your convenience with an annual or monthly webinar membership. Use webinar coupon code - doover15 - for 10% off anything at www.FamilyTreeWebinars.com or www.LegacyFamilyTreeStore.com, valid through Monday, January 26, 2015. These tips were presented live during the recent after-webinar party of Marian Pierre-Louis' recent webinar, Expanding Your Research from a Single Fact and compliment/reinforce what she taught. Genealogy - "kind of creepy?" My 14-year-old son, Evan, who once proclaimed, "But Dad, I thought genealogy was boring...this is so...much...fun!" (read about it here) reacted a little differently as we did genealogy together last night. "So in a way, genealogy is kind of creepy?" I asked, "what do you mean - creepy?" Laughing, I responded, "Right! We're trying to learn as much as we can about our ancestors, aren't we!" As soon as this part of the conversation came to a close, I thought to write it down. Evan asked, "what are you doing?" I responded, "this is going in my next book." It isn’t often that we get a “do-over” when it comes to stuff that matters in life. When you first got started researching your family history, did you do some things that now are just plain “embarrassing” such as name collecting, not citing sources and more? Well now there’s hope since genealogists from beginner to advanced are employing new research methodologies and documentation practices. In this webinar, follow genealogist Thomas MacEntee as he basically starts his genealogy research from scratch but includes sound research practices and methodologies as well as new templates, tools and the latest technology to create a better body of family history research. Join us for the live webinar Wednesday, January 21, 2015 at 2pm Eastern U.S. Register today to reserve your virtual seat. Registration is free but space is limited to the first 1,000 people to join that day. Before joining, please visit www.java.com to ensure you have the latest version of Java which our webinar software requires. When you join, if you receive a message that the webinar is full, you know we've reached the 1,000 limit, so we invite you to view the recording which should be published to the webinar archives within an hour or two of the event's conclusion. I think this should be one of the must-sees for anyone taking on genealogical research. Extremely well structured and presented. By using the "one-fact" approach, Marian really teaches what good research is about, how to find and use clues one might otherwise ignore and how to avoid guesswork while building toward solid info, bit by bit. Great advice to open up one's thinking and use "non-genealogy" sources. Great way to provide both context and more clues, and make our ancestors come alive for us. A brilliant Webinar, very many thanks for giving me so much information on research techniques. Congratulations to all at Legacy! Excellent methodologies, especially for those without much non-genealogical research experience. And - I learned several helpful tips on Legacy in the after-party! If you could not make it to the live event or just want to watch it again, the 1 hour 39 minute recording of "Expanding Your Research from a Single Fact" is now available to view in our webinar library for free for a limited time. Or watch it at your convenience with an annual or monthly webinar membership. 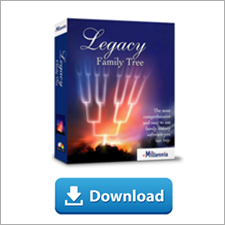 Use webinar coupon code - fact - for 10% off anything at www.FamilyTreeWebinars.com or www.LegacyFamilyTreeStore.com, valid through Monday, January 19, 2015.